Several retail outlets in the Ho Municipality run out of stocks of chocolates on Valentine's Day, checks by the Ghana News Agency has revealed. 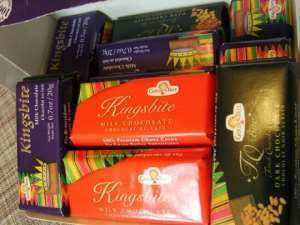 As early as 1400 hours, brands under the Golden Tree chocolate bars, notably Kingsbite, were sold out. Yvonne Klu, a salesperson at the Ho branch of Melcom, said three large boxes of Golden Tree chocolates in stock were cleared by midday, and that there had been an increase in sales compared to last year. A manager at Vicarchie, a popular supermarket in Ho, known commonly as 'Letsa' said 34 cartons of the local brand were sold on Valentine's Day, and this is a significant increase, compared to last year's sales. Madam Margaret Akatti, Proprietor of Maggie Sugar Craft Institute, a major cake outlet, said sales has been 'very poor' during the period because of the crave for chocolate. Mr Frank Smart Hodogbe, a Supervisor at KCS Foods, a restaurant chain, said a Champions League match on Wednesday evening delayed Valentine's Day celebrations at its branches till 2200 hours. He said branches were filled to capacity soon after the match, and said pizza topped the sales list until the last customers left around 0100 hours. Gifts shops GNA visited reported good sales of teddy bears, perfumes, and lingerie.